The ExSys was presented to the public for the first time at an exhibition in Scotland. Electromach wanted to show an animation to accompany the launch. In only two minutes time, the prime benefits of the ExSys are emphasized. Continuously wanting to improve ourselves, we approach each of our projects with a great deal of Research & Development. This way we’ll always be up-to-date with the latest trends within our branch. You can read about some of our R&D cases incorporated into this project below! We’ve been making animations for the technical branch for a few years now, and industrial backgrounds keep returning. Therefore, we designed and developed a modular system of industrial objects. 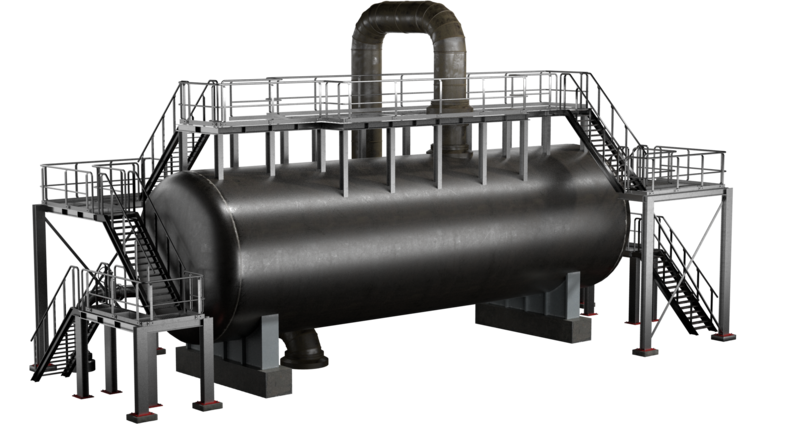 This system consists of various types of pipelines, connectors, scaffolding, staircase systems and even entire distillation towers. It demands a bit more time and thinking while building the models, but that’s easily recovered in the longer term. Just for this animation alone, various industrial backgrounds were required. 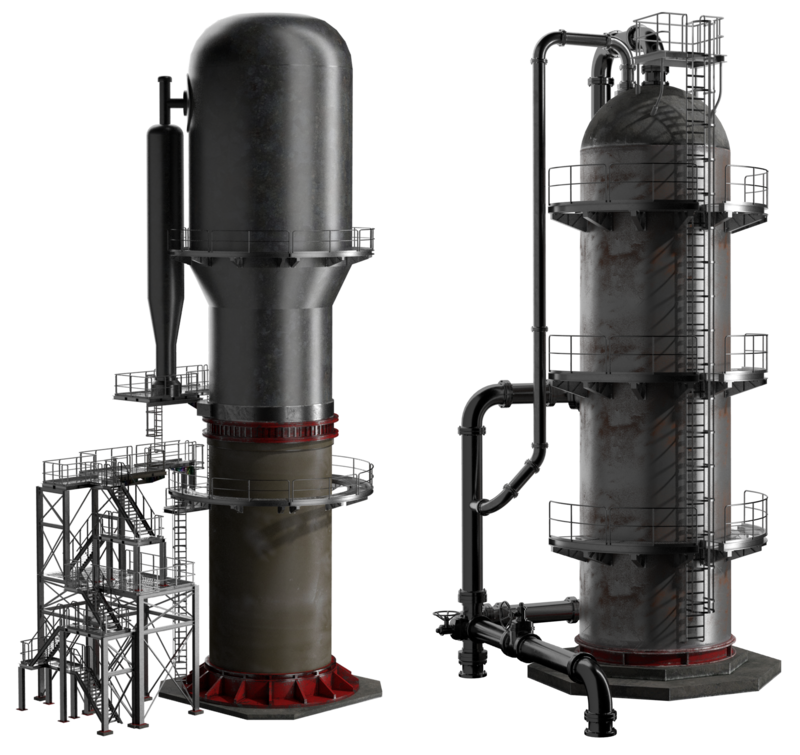 Through using the modular system, different refineries could be set up in just a short space of time. To take our texturing skills to the next level, we further researched how materials are built up in real-life. A refinery is anything but a sterile environment. Chipped paint, damaged metal and sandcovered materials. These are the type of materials you expect to find there. The materials consist of different layers. For example: a base of scratched metal, on top of that flaked paint added with a layer of sand. In the example below, you are able to see the weathered metal through the paint. Electromach offers a solution for every place and any weather condition found on our planet. A high-res globe was needed to zoom in multiple times to show the most extreme conditions. Of course, you wouldn’t want to see giant pixels because of insufficient resolution. Therefore, 16k texture maps are used for city lights, border boundaries and connectivity points. In addition to that, we created procedural textures so high that detail remains even in close-up. A brief shot is used to showcase the offshore location with an oil platform on rough sea. Because the shot only lasts for two seconds, it was out of proportion to simulate an entire storm at sea. Using procedural displacement maps, we created a complex, animated ocean material. This material converts a smooth plane into a rough sea.